The Hoss Seeder is the best solution to all your planting needs. The versatility and simplicity of the Hoss Seeder makes it superior to the competition. Our Seeder uses a fixed gear ratio-seed plate design, which means you don’t have to worry with changing gear ratios to change planting patterns. Additionally, our seed plates lay horizontally instead of vertically which improves the ability of the seed plate to pick up a single seed at a time. Finally, our seeder is more durable as it is made of powder coated steel and not aluminum. The Hoss Seeder works as an attachment to our Hoss Wheel Hoes and can be used with either the Single or Double Wheel Hoe. The Hoss Seeder features an easily adjustable planting depth control on the front where planting depth may be adjusted every 1/4 inch. 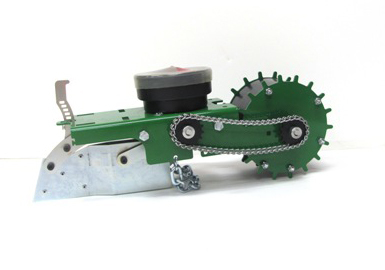 Once a seed is delivered via the seed plate through the seed tube into the ground, the drag chain covers up the seed and the back wheel of the seeder serves to compact the ground behind the covered seed. The width of the back wheel makes our seeder much more stable than the competition, and much easier to push in a straight line. The hopper (pictured below) of the Hoss Seeder holds the seed plate and the brushes with a wing nut. 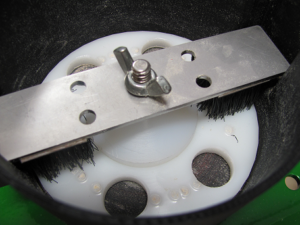 This simple design makes it easy to change out seed plates, simply by removing the wing nut and brush. As the back wheel of the seeder turns, the seed plate turns while the brush ensures that only one seed is placed in each hole. Then as the seed plate moves over the hole in the hopper, the seed drops through the seed plate and into the seed tube for planting. Seed Plates #1-6 are included with every Hoss Seeder purchase, and Seed Plates #7-10 are available for individual purchase, or as a package deal. 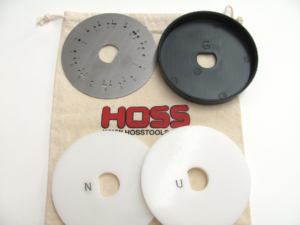 In some cases, you may wish to use a different seed spacing than what the Hoss Tools pre-drilled Seed Plates are designed to plant. For every full rotation of the back wheel, the seed plate in the hopper will turn a full rotation as well, and the seeder will have traveled 19″ in this time. Therefore, if you divide 19″ by the number of holes in a given seed plate, this will provide you with the seed spacing distance. For instance, Seed Plate #6 for field corn has four holes, which means that this particular seed plate will plant a seed every 4 3/4 inches. A simple solution to increasing spacing between plants is to place tape over some of the holes on a seed plate. Simply place a piece of Scotch tape on the bottom side of the seed plate over the holes you wish to cover. Make sure that you cover an even number of holes and that the holes covered are opposite one another on the seed plate. Using the above example with Seed Plate #6, if two of the four holes were covered, the seed plate would now plant field corn with 9 1/2″ spacing between seeds. Another solution to seed plate customization is our Customizable Seed Plates and Metal Drill Template (above). We offer blank seed plates in three different thicknesses, 3/32″, 3/16″, and 1/4″, for customizing seed plates for a variety of seed shapes and sizes. The Metal Drill Template is very useful in marking holes for drilling into the Customizable Seed Plates, ensuring that hole spacing is equal between all holes. 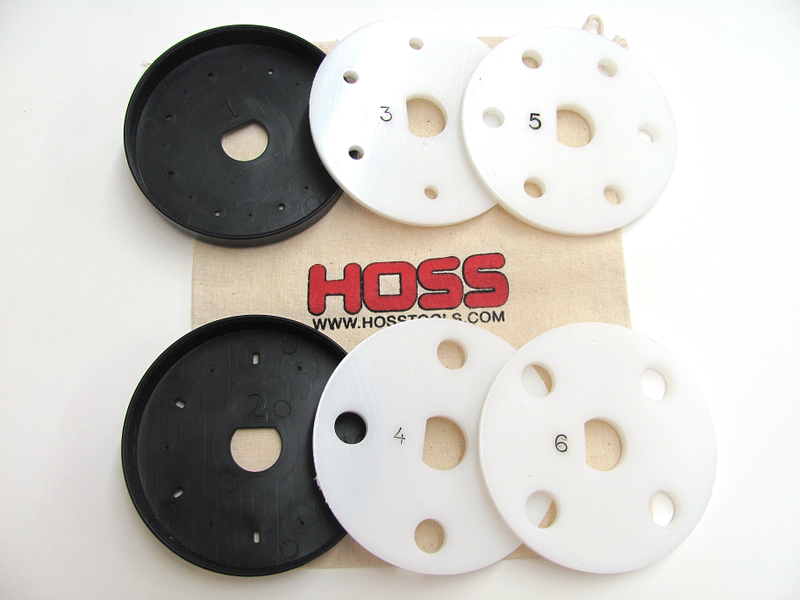 The simple, yet effective design along with the seed plate customization make the Hoss Seeder the most versatile and BEST garden seeder on the market!